THE CONDUCTORS | Collegium Musicum Bologna and has been with the Collegium Musicum since 1980 as its principal Conductor. He has directed a wide repertoire with various groupings of the Collegium Musicum, including transcriptions of new works. In 1984 he received a degree in choral direction from the Accademia Filarmonica of Bologna. Besides directing the Collegium Musicum, he served until 2015 as an English language instructor at the University of Bologna linguistic center (CLA). His musical and linguistic interests often combine in the form of metric translations. 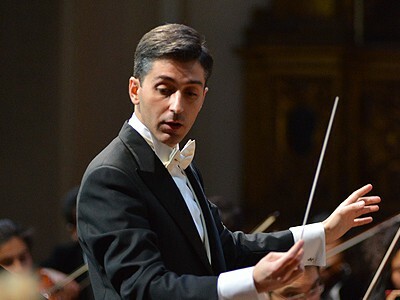 Roberto Pischedda finished his diploma in orchestra direction at the Conservatory "G. Pierluigi da Palestrina" in Cagliari, Sardinia, then attended the L. Cherubini Conservatory in Florence. 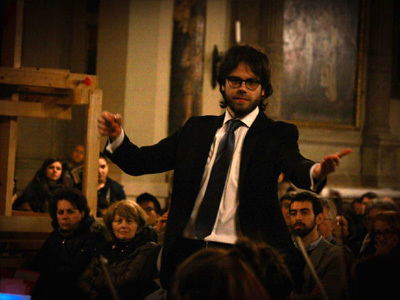 In 2011 he earned his second-level degree with full marks studying under maestro Alessandro Pinzauti. Between 2009 and 2011 he also trained with Nicolas Pasquet and Ralf Weikert, then became an apprentice to Piero Bellugi, with whom he deepened his knowledge of symphonic and operatic repertoire. In Cagliari he collaborated with the Conservatory as pianist, harpsichordist, organist and orchestral instructor. Since 1998 he has directed the G.B. Martini Choir, and since 2007 he has served as Resident Conductor for the Sinfonietta Claudio Monteverdi Orchestra, which he has directed in numerous concerts — often in collaboration with prestigious groups such as the Mozart Association Italy. From 2012 to 2013 he was the Assistant Musical Director of the Teatro Lirico in Cagliari, directing the theater’s choir on various occasions and collaborating with (among others) Aldo Ceccato, Filippo Maria Bressan and, most recently, with Anthony Bramall in the first modern revival of the opera "The Shardana" by E. Porrino. Since 2013 he has served as the Collegium Musicum’s orchestra director and instructor. Enrico Lombardi began private study of the piano and organ, then took courses with the Organ Academy at "Giulio Perticari" high school conservatory in Senigallia, under the guidance of Federica Iannella. After studying composition at the conservatories of Bologna and Ferrara, he earned his diploma in Coral Music and Direction with full marks under maestra Maria Elena Mazzella. He graduated from the University of Bologna — DAMS in Music. He has earned the academic degree in Orchestra Direction at Conservatorio "L. Cherubini" under the guidance of Alessandro Pinzauti. He is Collegium Musicum’s choral director and previously served as Director and President of the organization. Other previous positions include Assistant Artistic Director of the International Organ Festival for the city of Senigalia and assistant to Michel Tabachnik during an advanced course in orchestra direction at the Accademia Musicale Chigiana, where he studied secular and polyphonic choral music under Roberto Gabbiani. He also studied choral direction with Filippo Maria Bressan and orchestra conducting with Francesco Lanzillotta.